The leg press is a effective alternative to the squat. I would classify it as a weight lifting exercises for osteoporosis. The following video demonstrates proper leg press form so it is a safe exercise for people with osteoporosis or osteopoenia. One of the challenges with the leg press (especially for women) is the design of the seat. Many women find themselves leaning forward (or into flexion) when they apply the press and compromising their postural alignment. This is not good form and needs to be modified. I will demonstrate proper leg press form in the video and below you will find a detailed description of the steps involved in proper leg press technique. Pay attention to the placement of the seat. They are often too far back for many women and at an angle. This causes the user to go into a flexion posture — something that should be avoided by people with osteoporosis. The grips or handlebars at the base of the machine are too low for many women. This causes you to extend your reach down and go into a flexed posture. You want to stay tucked back with shoulder blades at the back of the seat to ensure good form and posture throughout the exercise. If you cannot safely reach the handles or grips at the base of the machine, hold the base of the seat instead for stability. The good news is that the exercise can be good for your bone health. However, pay attention to your leg press form and a few small modifications can make this effective exercise safe for you. I encourage you to incorporate the leg press into your weight training exercises for osteoporosis program. 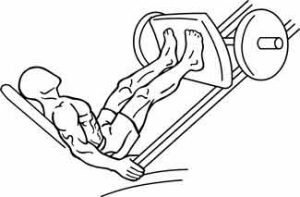 However, pay attention to how you execute this exercise and your leg press form and you will enjoy many years of safe bone building. 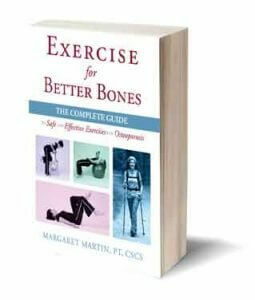 To learn more about a comprehensive exercise program for osteoporosis, I encourage you to check my Exercise for Better Bones program. What are the merits or drawbacks of the 45 degree leg press (v.s. the one shown in the video)? Great question. The merits are so minor I cannot think of any! It is difficult to get on and off the seat without “slouching” or coming into some forward bending of your upper back. Most seats do not have head support and therefore more stress is placed on the neck musculature – remember to keep your tongue to the roof of your mouth! Either way, the leg press, works your lower body but does not have the added benefit of getting your back muscles involved and stronger. It is also less “functional” in that it does not teach your body how to prepare for heavy lifts that you might encounter in your day to day activities i.e. lifting kitty litter bags etc. Sorry for being so slow in replying – missed it first time around. 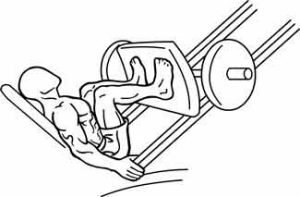 The drawbacks of the 45 degree leg press are that you are forced to curl as you get into and out of the seat (unnecessary forward bending of the spine). This is not an issue with a more horizontal seat. Also, some of the leg press units do not have a head support and for many this can place a lot of strain on the neck.